OXFORD, Miss. – The University of Mississippi Department of Music is expanding its graduate program offerings beginning this fall, adding a Master of Music with emphases in musicology, ethnomusicology and music theory. “The department is adding these new programs because we want to better serve the students of Mississippi and the region,” said Alan Spurgeon, professor of music and the department’s director of graduate studies. The addition of these degrees “will significantly expand and enrich our graduate program,” said Robert Riggs, chair of the music department. “Very few universities in this region offer graduate degrees in these important fields – we will be the only one in Mississippi where students can pursue ethnomusicology – and thus, we hope to attract many applicants,” Riggs said. John Latartara, associate professor of music, is heading up the music theory program; George Dor, professor of music and holder of the McDonnell-Barksdale Chair of Ethnomusicology, is in charge of the ethnomusicology program; and Thomas Peattie, associate professor of music, is leading the musicology program. Expanding the music department’s program options “will make for a more diverse student body,” Spurgeon said. 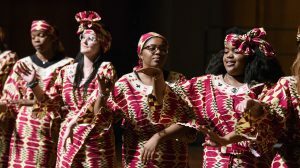 The university has been building its program in ethnomusicology since 2001, said Dor, who also directs the Ole Miss African Drum and Dance Ensemble. Dor teaches world music classes and recently acquired several instruments from Ghana for use in classroom learning and performances. “Given ethnomusicology’s tendency to focus on the ethnographic study of non-Western art music forms, the new program will train and equip prospective students to research either the rich music cultures of our state and region or gain knowledge necessary for studying any other world music tradition,” Dor said.